Author: McBrier, Page Set In . . . Description: More than anything, Beatrice longs to be a schoolgirl. But in her small African village, only children who can afford uniforms and books can go to school. Beatrice knows that with six children to care for, her family is much too poor. 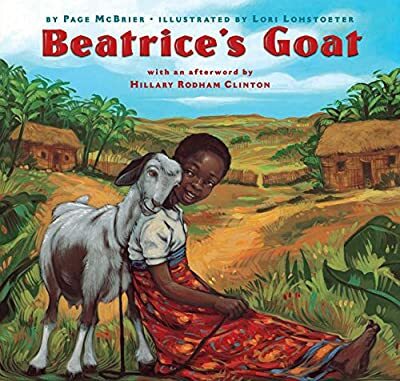 But then Beatrice receives a wonderful gift from some people far away -- a goat! Fat and sleek as a ripe mango, Mugisa (which means "luck") gives milk that Beatrice can sell. With Mugisa's help, it looks as if Beatrice's dream may come true after all. Page McBrier and Lori Lohstoeter beautifully recount this true story about how one child, given the right tools, is able to lift her family out of poverty. Thanks to Heifer Project International -- a charitable organization that donates livestock to poor communities around the world -- other families like Beatrice's will also have a chance to change their lives.